Registration and Badge Pick-up is located inside the main entrance of the American University Washington School of Law. Getting attendance approval from your manager is sometimes a challenge, as it take time and money. Customize this letter and provide your manager with a detailed explanation of the education you will received at CALIcon18. We believe the CALIcon Conference should be truly open for everyone. As such, we are committed to providing a friendly, safe and welcoming environment for all, regardless of gender, sexual orientation, disability, ethnicity, or religion. You will be taken to Eventbrite to complete your registration. CALIcon18 accepts several methods of payment: check, Visa, Mastercard, Discover, and American Express. Payment must be made before picking up your badge. Full refund: Cancellation notices must be received by 11:59 p.m. PT on Friday, June 1, 2018. No refunds will be processed for cancellation notices received after 12:00 a.m. PT on Saturday, June 2, 2018. If you need to make a change to your registration, please forward your request to our registration team via email. Please allow up to 48 hours for your request to be processed. I have received a promo code. How do I apply it to my registration? 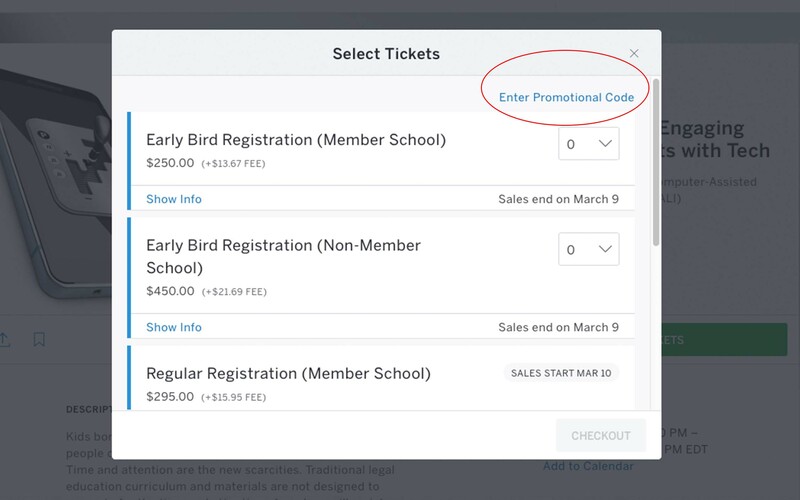 Once you reach the Eventbrite "Select Ticket" page, in the upper right hand corner is a "Enter Promotional Code" link. Click on it and and insert your promotional code. When finished, click the "Apply Code" button to recalculate your registration fee. If you have already registered, please forward your promo code to our registration team via email. Please allow up to 48 hours for your request to be processed. Any refunds issued will usually post to your account within seven to ten business days after the request has been processed. If you are unable to attend CALIcon18, you may transfer your paid registration to another person within your organization by submitting the new attendee's name and contact information here. Substitution requests will be processed free of charge if requested by Friday, June 1, 2018, at 11:59 p.m. PT. Substitution requests after this date are subject to a $25 transaction fee. Whom can I call for assistance with registering for CALIcon? Guest will not be permitted to attend any CALIcon18 educational activities. Guest/Spouses/Significant Other is allowed to attend the Thursday Night Reception with the purchase of a ticket. Does CALIcon18 have a code of conduct?